As parents we know how fiercely we would protect our children if they were in any form of danger. I have a 19-month old who just loves to climb. I find her walking on the kitchen island bench, monkeying along railings one-metre off the ground, and on several occasions during our renovations I’ve heard her calling out only to discover her half-way up a very large ladder. It’s hard enough to protect our little ones when they are in our care, but even harder when they are in the care of others. I don’t know about you, but the day I dropped my firstborn off to daycare I walked in inspecting the fencing, I had been on several visits prior to get to know her carers, and I called them through the day to see how she was going. I felt so relieved to pick her up at the end of the day (OK, it was about 2pm) and see her safe and sound. I’m going to hit you with some gut-wrenching statistics, but stick with me, because I’ve found an awesome resource that will empower you as a parent to protect your child when they are in the care of others. Statistics show that 1 in 5 children are sexually abused before the age of 18 in Australia. While most abuse happens in homes a percentage does happen in the trust of organisations who work with children. If you know your home is safe, then the next thing to do is to take measures to ensure our children are safe when they are not in your care? 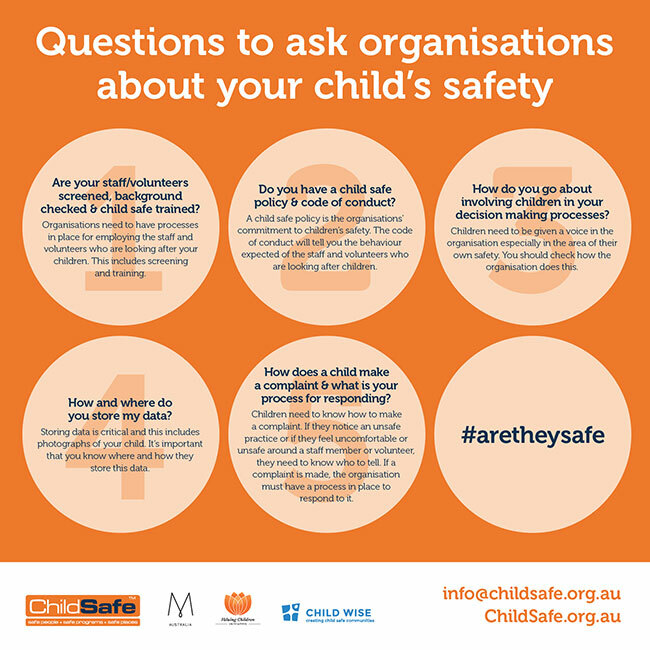 I recently discovered this simple but effective resource released by ChildSafe Limited, an Australian Child Harm Prevention Charity, that features five questions you can ask your children’s organisations about their safety policies and procedures. The questions address staff child-safe training, the existence of child-safe policies, the involvement of children in knowing about their own safety, data storage and child complaint processes. 1. Are your staff/volunteers screened, background checked and child-safe trained? 2. Do you have a child-safe policy and code of conduct? 3. How do you go about involving children in your decision-making processes? 4. How and where do you store my data? 5. How does a child make a complaint and what is your process for responding? Neil Milton, ChildSafe General Manager explains that the resource was created to empower parents in the fight to stamp out child abuse in Australian organisations. “As a parent I know how much trust we put in the organisations that care for our children, whether it be daycare centres, sporting clubs or schools. We tend to assume that organisations are doing what is required of them in terms of child safety, but this resource will give parents the power to keep organisations accountable,” Neil says. “When your children are in your sight, you can keep them safe. These 5 questions will help ensure that when your children are out of your sight, you have chosen the best organisation for them to attend,” says Neil. Resilient Kids Conference Founder, Sharon Witt says they will distributing the resource to the 5000 parents, educators, youth leaders, chaplains and people who work with child who are attending their 8 conferences held around Australia throughout 2019.